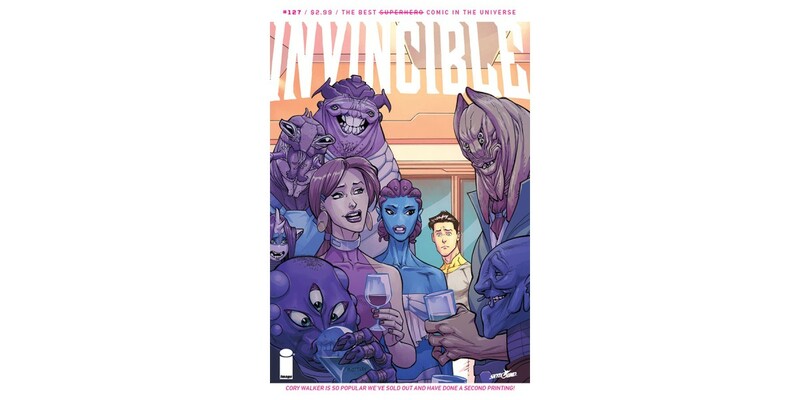 INVINCIBLE #127 by writer/co-creator Robert Kirkman (THE WALKING DEAD, OUTCAST BY KIRKMAN & AZACETA) and artist/co-creator Cory Walker is being fast-tracked to a second printing by Image/Skybound Entertainment in order to keep up with customer demand. The issue marked original series artist Walker’s long-awaited return and first full story arc since Ryan Ottley took up art for the book in 2004. In INVINCIBLE #127, Mark has returned from the past... to a very different future. Now he has to pick up the pieces of his life and try to put them back together. INVINCIBLE #127 remains available for purchase across all digital platforms, including the Image Comics website (imagecomics.com), the official Image Comics iOS app, Comixology’s website (comixology.com), iOS, Android, and Google Play. INVINCIBLE #127, 2nd printing (Diamond Code MAR168716) will arrive in stores on Wednesday, May 25. The Final Order Cutoff deadline for retailers is Monday, May 2.